This month’s Monthly Technique Challenge for September is Framing. And what I mean by that is to take a stamp you have, stamp it, and then create a frame around it. Depending on where you put that frame can make all the difference in your card. And there are many ways to make a frame. You can draw it on your paper around your image, you can use a die cut to cut out a rectangle and use the hole to make the frame, or even take the part you cut out and sponge around that piece to make a frame. 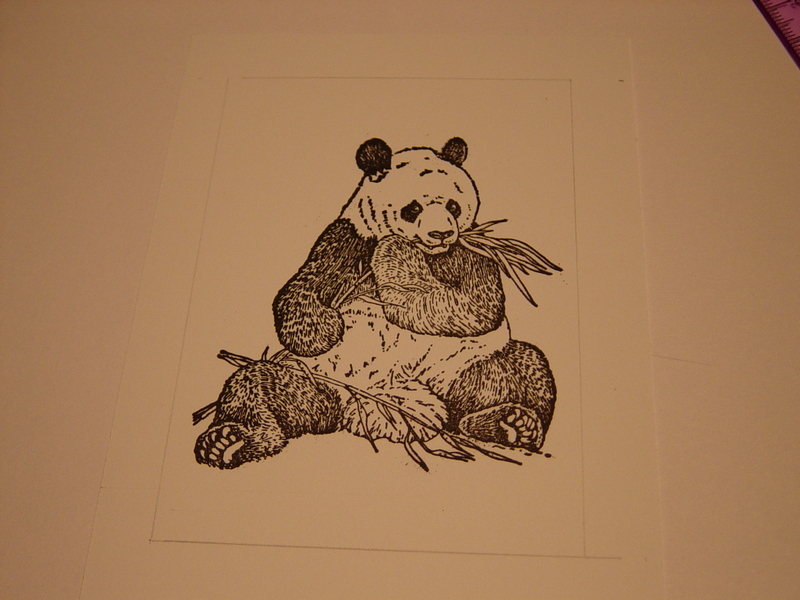 Then I penciled a frame around the panda. Once I made sure it was the way I wanted it, I then used my ruler again and did the line in ink. Now in the above picture, I just have a regular box around the panda. I repeated the process on another piece and moved the box so his foot was hanging out of the frame. This is beautiful when you use a plant stamp, having some of the plant inside the frame and some outside. It really gives depth to your card. If you decide to use a die-cut to cut out a rectangle in a piece of card stock and use the center hole to make your frame, then just sponge in the center to make a contrast between the center of the frame and the outside. Or you can use the part you cut out of the center to mask the center of your and build your frame around that by sponging everywhere but where that mask is. When you remove the mask, you would then stamp your image wherever you want it either all within the center part, some outside, etc. Since I was busy playing around with framing, I made 5 cards as I was trying different ways to frame. You can see them below. For the first one, all of the panda is inside. 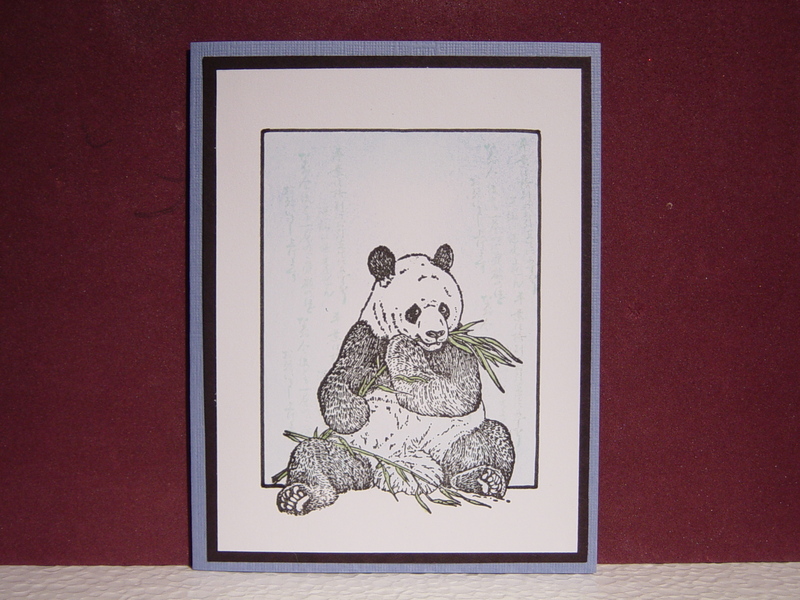 I sponged a little green under him for ground and colored the bamboo but otherwise left him alone. For that next one, I hung his foot out of the frame. I didn’t color the ground (but in looking at it, I think I’ll go back and do that so it doesn’t look like he’s floating). 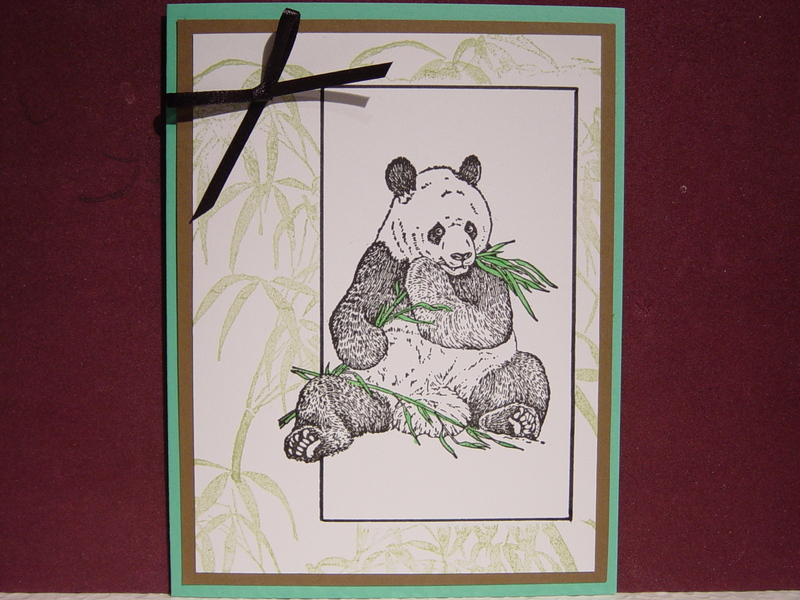 I masked the center and stamped bamboo around the outside of the frame. 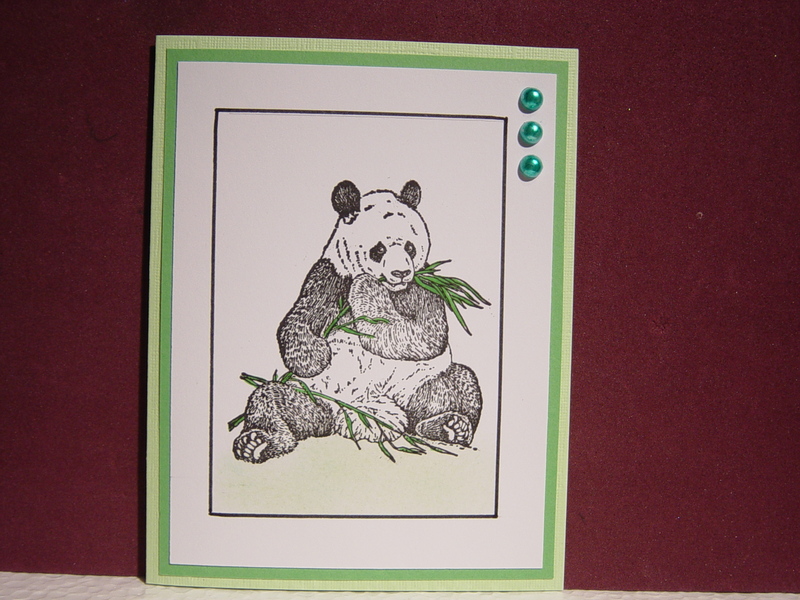 For this next one I used a die-cut and cut out the center and then sponged through the center. 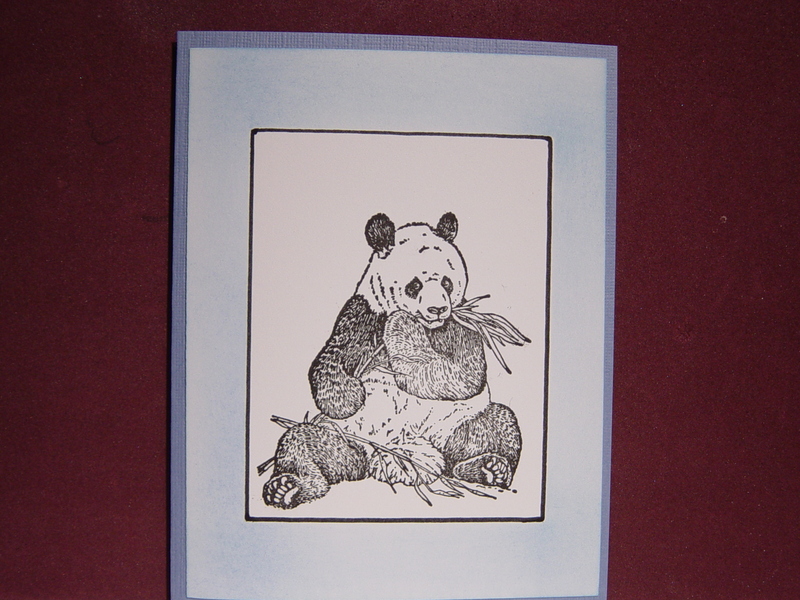 I then stamped Asian words in the center around the panda. For the fourth one I used the center piece from the die cut box, masked the center, and sponged around the outer part in blue. 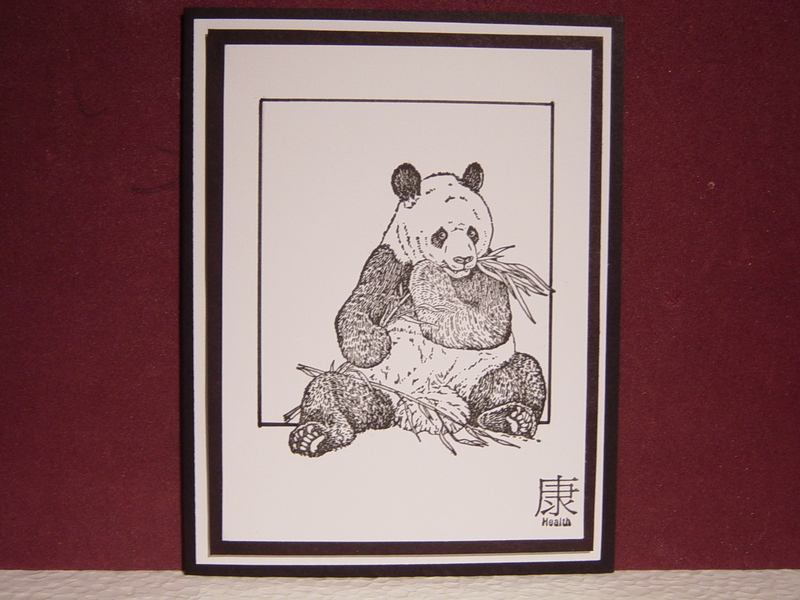 And for the last one I just drew the box around the panda with his feet outside the frame. Do you see the different it makes in the cards on where you place the frame? Now please go and make cards for the September Monthly Technique Challenge – Framing.